Childhood ataxia and central nervous system hypomyelination (CACH), also known as 'vanishing white matter disease' (VWM), is a leukoencephalopathy with autosomal recessive inheritance. It is characterised by normal psychomotor development initially, with an onset of neurological deterioration that follows a chronic and progressive course. Stress conditions such as febrile infections, minor head trauma or even acute fright provoke major episodes of neurological deterioration. We present a case of a 2-year-old child who presented with spasticity and cerebellar ataxia. After magnetic resonance imaging (MRI) of the brain, CACH/VWM was diagnosed on the basis of the typical clinical and MRI findings. As there is no known cure for CACH/VWM, our patient was followed up over 3 years with MRIs of the brain to assess the progressive involvement of the cerebral white matter. In those patients with suggestive or inconclusive MRI findings for CACH/VWM, particularly in the presymptomatic stage and adult onset variants, involvement of the inner rim of the corpus callosum should prompt the inclusion of CACH/VWM in the differential diagnosis. Biochemical markers such as the asialotransferrin:transferrin ratio in the cerebrospinal fluid can also potentially be used as a screening tool in this subset of patients prior to gene mutation analysis. The exact prevalence of VWM is unknown; however, it may be one of the more common leukodystrophies.3 In a study of unclassified leukodystrophies in childhood by Van der Knaap et al., CACH was the most common, with 21 of a total of 92 patients found to have magnetic resonance imaging (MRI) features of CACH/VWM.6 This article aims to provide more insight into CACH/VWM, with a focus on the progression of the MRI brain imaging findings in our patient, who was imaged over 3 years. Our understanding of CACH/VWM continues to evolve, with increasing literature over the last two decades providing a better understanding of the imaging findings and genetic mutations. We present a case of a 2-year-old child who initially presented with cerebellar ataxia and spasticity and was subsequently booked for MRI of the brain. The provisional diagnosis was that of CACH/VWM based on the clinical presentation and classical MRI findings. The initial MRI (Figure 1a-c) demonstrated diffuse, symmetrical, white matter signal abnormalities with mild cystic degeneration and involved the corpus callosum, basal ganglia and cerebellar white matter. These regions corresponded with high signal intensity on the T2 weighted image (T2WI), proton density (PD) and fluid attenuation inversion recovery (FLAIR) sequences and showed no enhancement post-gadolinium. There was sparing of the subcortical white matter. 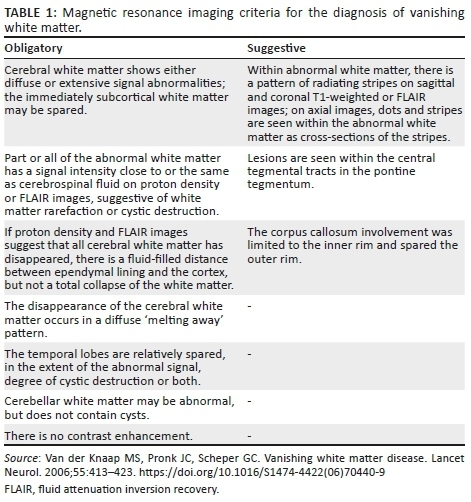 A radiating linear pattern within the abnormal white matter was suggestive of the remaining normal white matter tracts (Figure 2a). The corpus callosum involvement was limited to the inner rim and spared the outer rim (Figure 3a). Diffusion-weighted images showed an increase in diffusivity of the abnormal white matter, which was likely secondary to the rarefaction and cystic degeneration. Follow-up MRI of the brain after 1 and 2 years (Figure 2a-c and Figure 3a-c) demonstrated progressive cystic degeneration in a radial pattern of the affected deep white matter over time, with signal intensity changing to that of cerebrospinal fluid (CSF) on T2WI, FLAIR and PD sequences. Initial motor and mental development is normal or near normal. Neurological deterioration has an early-childhood onset with an episodic and chronic progressive course. Neurological signs of spasticity and cerebellar ataxia (epilepsy and optic atrophy may also occur, but are not mandatory). Magnetic resonance imaging findings of symmetrical and bilateral involvement of the cerebral white matter, with parts or all of the white matter demonstrating signal intensities similar to that of CSF over time. Childhood ataxia and central nervous system hypomyelination (vanishing white matter disease) is a chronic and progressive white matter disorder, often exacerbated by infection or minor head trauma. The proposed diagnostic and MRI criteria assist in making the diagnosis of CACH/VWM with a high degree of certainty in those patients with typical clinical and MRI findings. However, in those patients with suggestive or inconclusive MRI findings, involvement of the inner rim of the corpus callosum should prompt the inclusion of VWM in the differential diagnosis. Cerebrospinal fluid analysis of asialotransferrin:transferrin ratio can also be used in this subset of patients as a screening tool prior to gene testing. D.M. was responsible for the review of literature, review of the imaging studies and preparation of the case report as per the journal requirements. N.M. was responsible for the diagnosis of the case, interpretation of the imaging studies, initial write-up of the case report and editing of the final article.